Volunteers are always welcome to help with our parish life, whether that is helping with a Ministry at Mass or helping with one of our groups or other activities. Please contact us if you are interested in helping or participating in any group, ministry or activity. There are many different Ministries that people can volunteer to assist with at Sunday Mass and other liturgical celebrations throughout the year, all of which help to ensure that the Mass is celebrated as a prayerful and respectful celebration. Altar Servers are assistants to the celebrant during Mass. They carry out many duties during Mass, such as carrying the processional cross and candles and preparing the altar. There are several very talented musical groups in the Parish, all of which contribute to our liturgical celebrations in a very special way. Children’s Masses are held during the 11.00am Sunday Mass at St. Teilo’s several times a year and at other times of special celebration. The Children’s Liturgy of the Word takes place each Sunday in school term time at the 11.00am Mass at St. Teilo’s. 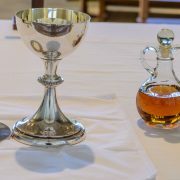 From the very earliest times, the Church has believed that the Bread and Wine consecrated during Mass truly becomes the most precious Body and Blood of Jesus. In accordance with Canon Law (Canon 537) the Parish has a Finance Council which meets quarterly to assist the Parish Priest with the financial administration of the Parish. The group is made up of Canon Isaac, David Roblin, the Parish Treasurer, Keith Burleton, Peter Searle and Anna Wilshin. A small and very dedicated group of volunteers meet at both churches each week to ensure that they are fitting places in which to offer worship God. Flowers for Sunday Mass and other important liturgical celebrations are arranged by a group of volunteers in both churches. Beautiful creative displays are designed and set up several times a year and act as a visual reflection of the seasons or events which are being celebrated. The St. Vincent de Paul Society (SVP) is an international organisation dedicated to helping those most in need by providing practical help to the most vulnerable in society. The Bereavement Group exists to offer help and support in a relaxed and sympathetic setting to those who have experienced bereavement. The Padre Pio Prayer Group has been established in the Parish for more than twenty years. The Parish Rosary Prayer Group meets on the last Thursday of each month at 2.00pm in Ty Mair, 19 Heol y Waun CF14 1LB (junction of Heol Gabriel/College Road) to pray/discuss the Rosary and have a cuppa! All are very welcome to come along and join in prayer and devotion to Our Lady. Social Groups exist at both St. Teilo’s and Our Lady of Lourdes to bring our community together in a relaxed social setting. The Newsletter Group consists of a very small number of committed volunteers who are responsible for the production of the weekly Parish Newsletter. The Piety Stall, located at the back of St. Teilo’s, is a small stall selling a range of religious items for many occasions. The Association for the Propagation of the Faith (APF) was founded in Lyons, France in 1822 by a young French woman, Pauline Jarico. She encouraged people to support the work of the mission by giving a farthing a week. Missio is the Catholic Church’s official support agency for overseas missions. Coffee mornings are held at various times in both St. Teilo’s and Our Lady of Lourdes and are friendly setting in which people can come together and enjoy a chat and a cup of tea or coffee with fellow parishioners. Tea and coffee is served after each Sunday morning Mass at St. Teilo’s once a month. For more information check the newsletter.